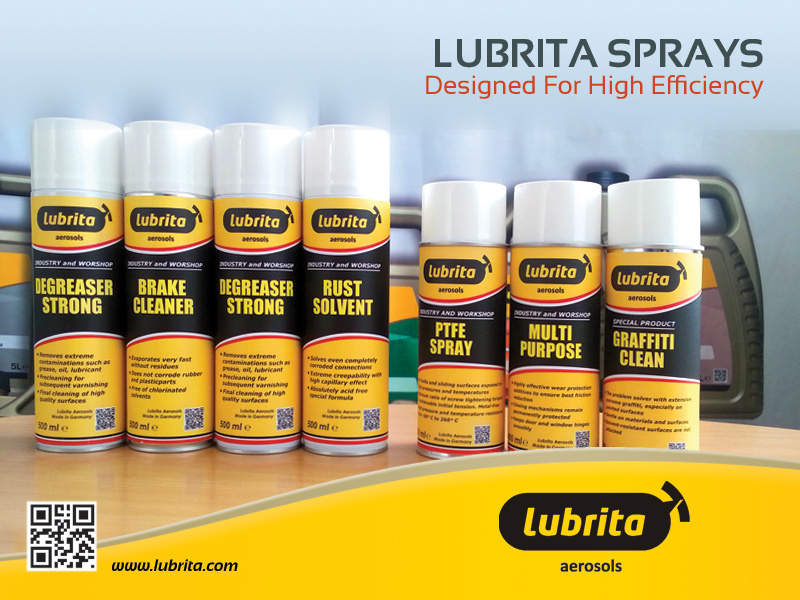 Lubrita Technical Sprays and Industrial Aerosols used by many companies for different industries and applications. In daily use, technical aerosols are indispensable as tools in industry and workshops. Whether heating, air conditioning, plumbing, automotive, industrial, construction, food industry, forestry or the service sector, there is now hardly an industry that wants to give up the comfortable application of most diverse means. Lubrita and Lubrita Sprays and Aerosols is your reliable partner. We refer to more than 25 years of experience in producing high quality technical aerosols. Our customers and business partners will benefit greatly by the high quality of our sprays and qualified consulting service from our experienced staff. To meet the latest demands of the market, we continuously develop our products and our service further for you. For us, this also means that for our products we will of course provide you with current safety data sheets in all European languages. We would also be happy to help you with questions regarding new formulations and desired modification of certain sprays. Our innovative product „LUBRITA SPAYS SYSTEMS“ currently comprises more than 150 different products produced in Germany in various types of packaging for a most diverse range of applications. We look forward to a lively exchange with you and to expanding our partnership! If you are interested in a representation abroad, please contact us directly or send an e-mail to info@Lubrita.com .